Chose from Black or Brown Crocodile Textured Belt. Made from the finest leather, your belt strap will be brown or black crocodile textured with a “cut-to-size” fitting system. A solid pair of scissors will do the trick when customizing. Straps come standard to fit waists up to 42”, but can be ordered to fit waists of up to 54”. On the back of the strap there is a size chart with 2” intervals. This will allow you to cut to the desired size. We recommend cutting 2” more than your waist size. Our one-of-a-kind “end clip” is added for easily interchanging your custom NCRS buckle and a standard prong buckle. 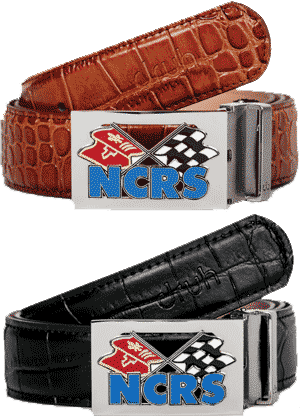 We hope you truly enjoy your custom NCRS belt!